Something very special happened to me during my screening of the new sci-fi horror thriller A QUIET PLACE. For the first time in my twelve years as a film critic I was able to watch a movie in a jam packed cinema with an audience that remained virtually silent throughout its running time. That's a large part of the ethereal power of director John Krasinski's mercilessly eerie and uniquely potent film (which he also co-wrote and stars in). I've rarely experienced movies that stand up and force viewers to re-evaluate and confront their own worst public cinema etiquette habits (i.e. - not talking throughout the feature, not lazily staring into your smart phones, and not treating the theater like your living room). A QUIET PLACE's brilliant premise and chillingly masterful use of sound (or lack thereof at times) makes people actively engage in what's transpiring on screen and become participants. Everyone around me at the screening - myself included - refrained from making any noise (even from opening pesky candy bar wrappers or crunching on popcorn) because the film is so hauntingly void of sound that it makes you constantly and consciously aware of the very sound you're making while viewing it. I haven't seen a capacity crowd audience as uniformly transfixed by what's on screen here in an awfully long time. A QUIET PLACE is also a heart-warming tale of family survival when facing nearly insurmountable circumstances that threaten their very existence at every waking moment of the day. Krasinski establishes the particulars of this his post-apocalyptic world of the not-to-distance future with remarkable restraint, storytelling economy, and a refreshing lack of overdone expositional particulars. The movie thrusts us right smack dab into its nightmarish premise without looking back, but it gives us everything we need to know about how a world that succumbed to disaster without wasting time with title cards or needless voiceover narration; we get some newspaper headlines here and there providing clues that allow us to fill in the blanks as to what happened. On an overtly simplistic level, A QUIET PLACE takes place over the course of a year in the early 2020's as a family tries to survive against an alien menace - which most likely came from a crashing meteorite - that attacks and kills indiscriminately based on sound alone. You so much as make a peep or step on something capable of producing a minor squeak and you're dead in seconds to minutes. These monsters are that lethal. This makes it particularly stressful for what's left of humanity to live safely under such an indomitable threat. As the film opens we get one title card that indicates that we're a few months into this post-invasion world, as we are introduced to a young five member family, comprised of father Lee (Krasinski), mother Evelyn (Emily Blunt), and their three kids, the hearing impaired Regan (Millicent Simmonds), Marcus (Noah Jupe), and Beau (Cade Woodwards), the latter who is so young that he can't quite comprehend what's happening around him. Lee commands the family with military-like precision when it comes to eliminating all noise from their lives - like speaking only in sign language (which they all know) and even trekking into abandoned towns and stores for supplies in barefeet as to not make footsteps. During one family trip to a drug store for meds for the sick Marcus little Beau picks up a battery powered toy space shuttle, which you just know will finger in later and spell doom for this family...which it does, leaving Beau the tragic victim of a alien attack in a scene that firmly establishes that this film will pull virtually no punches when it comes to establishing what a terrible danger these monsters present. A QUIET PLACE then flashes forward a year showing the family trying to move on from the death of Beau while preparing for the coming of a new child, seeing as Evelyn is several months pregnant and could give birth at any moment. Obviously, in a world that contains beasts that can kill you at any moment based on sound the notion of a crying baby being brought into the world has innumerable obstacles. Lee and Evelyn are up to the task, securing their home with surveillance cameras, colored warning lights, and a sound proof underground room with a few nifty contraptions to ensure that a cranky infant won't drawn attention to the extraterrestrial menace. Regrettably, Regan has grown rebellious and despondent in her young teens years and willfully seems to want to disobey her father's demands at all times, which places the family in danger. Within no time, everyone seems separated from each other and Evelyn prematurely goes into labor while alone, and all while accidentally tipping off the monsters. This movie gets serious mileage out of its nifty premise, which is as innovative as it is endlessly frightening. But Krasinski is not out to make an obligatory jump scare-athon (even though the film is a tad guilty of relying on them in a few key scenes). A QUIET PLACE is not concerned with barbaric violence and action, but rather with establishing an unnerving sense of sustained dread and unease throughout, which is made all the more queasy and creepy by how Krasinski and his sound engineers use sound to drum up nail biting suspense here. Now, there's suspense in knowing that, yes, these unstoppably fast and nearly invulnerable killing machines can get to any one of these family members in an instant, but Krasinski crafts Hitchcockian levels of anxiety in the most subtle ways like, for example, an exposed and erect nail pointing upwards from a stairwell. That's horrfying because (a) it'll hurt like hell when one steps on it and (b) the potential scream that will accompany stepping on it, tipping off the monsters. The implied threat of what's to come is what makes this film so bloody scary to endure. And then there's the use of silence throughout, which seems logical enough, seeing as the family communicates 99% of the time throughout the story using sign language (subtitles are used as well). Then there's other ingenious ways that the film shows its characters avoiding making sound, like showing the children playing Monopoly by using felt tokens and rolling dice on carpets. I can't remember the last time a modern horror thriller relied less on sound and dialogue than this one, which is ultimately refreshing in our relative day an age of genre efforts that can't exist without it. There's an undulating sense of environmental claustrophobia that A QUIET PLACE creates, and that specifically feeds into the audience. As the horror unfolds over characters - like one unbearably intense sequence that shows Evelyn having to give painful med-free birth in a bathtub without screaming - you feel trapped with them. You don't want to make noise while watching the movie because the characters don't want to either, which is so hard because noise is ostensibly such a part of the human condition and the ways most movies act on us. The mostly mute performances are key here as well, and Krasinski has arguably never given a more gritty and emotionally powerful performance in his career, making his father figure one of limitless inner fortitude and strength. I especially liked young Simmonds, a deaf actress that is also playing a deaf character here, and she demonstrates - like her fellow castmates - how the essence of human emotion can be frequently conveyed without words; she's absolutely superb here. Blunt (who's also Krasinski's wife in real life) is no stranger to action heavy films that pack visceral wallops, but here she plays a whole different kind of powerful, yet vulnerable female lead, relaying all of Evelyn's excruciating physical and mental pain while being pregnant, alone, and with no apparent help on the horizon. It's one of the most brutally expressive performances I've seen from her. For as traumatizingly terrifying and consummately executed by Krasinski as A QUIET PLACE is, the film manages to tackle relatable and universal themes of what it means to be a parent and the steps parents take to ensure their children's' safe upbringing. 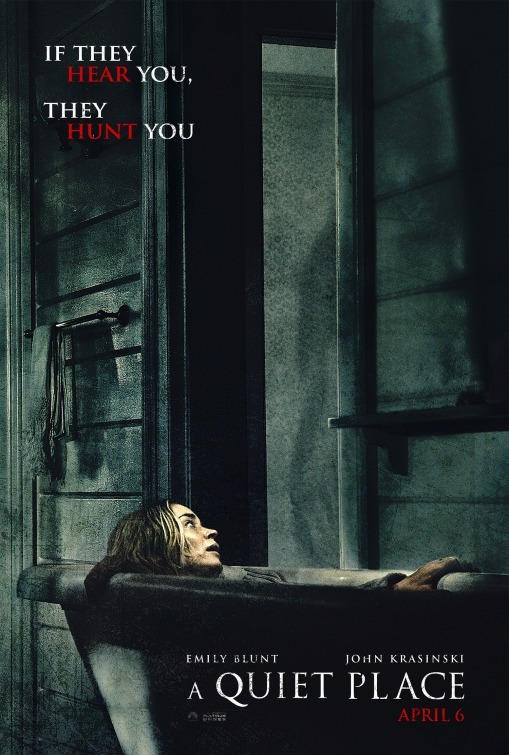 In a way, A QUIET PLACE - despite its macabre premise - is almost a metaphor for the strains of parenthood in a modern world, which gives the film an added layer of emotional complexity and depth of feeling that really helps separate itself well apart from other horror thrillers. There's also a message here - especially during the film's final moments - that sometimes kids don't need to be protected, but rather made to feel like their can protect themselves. There's a thoughtfulness to this film's execution that gives it a surprising poignancy amidst all of its monster mayhem. A QUIET PLACE suffers a bit when it comes to how easy it is to scrutinize some of its logical conundrums regarding how the monsters react to sound (a large body of river water, somehow, doesn't attract the aliens with the loud rapids, despite all other sounds attracting them), not to mention that Krasinksi could have avoided showing as much as the creatures as he does here (the notion that they're out there is scarier than seeing them in detail). The movie also ends a bit too abruptly for my tastes, but at a fast, nimble, and economically tight 90-plus minutes, Krasinski's third film behind the camera never wears out its welcome. A QUIET PLACE firmly establishes him as a rising directorial talent to be on the watch for. It's also an exceedingly uncommon breed of contemporary movie that demands consumption in a theater with a large audience and not on you home theaters or, God forbid, your smart phones or tablets. Any movie that demands viewers to become better cinema patrons via its creative choices on screen is a great movie in my book.